Call me impractical but I have been a huge fan of Starbucks since 2005. I’ve had so many memories in many of its’ different branches nationwide. Starbucks to me is a very special place that I go to when I want to hang out with some of my friends and reminisce the past. It’s also a good place to stay in when you are alone and you want to relish in the fact that you have nothing to worry about but yourself. Or perhaps when you are broken and nursing a broken heart. Starbucks not only offers delicious drinks, sumptuous snacks and many other original items but their branches also offer a place of comfort and solitude for all their customers. I call it a haven for many different purposes or perhaps, a second home. I’ve tried their lattes, their brewed coffee, their famous oreo cheesecake, their signature hot choco and most of all, their fabulous frappuccinos. They may not come cheap but to me, nothing compares to the quality of their products. No matter what you order, they never fail to provide you with only the best. Call me biased but that’s the way I see it. But in all my years of patronizing their products, I have never experienced getting their yearly planners yet. All that changed last year before Christmas. I’ve been trying my best to fill the sticker slots in my coupon for quite a while now and I was already thinking that it would be hopeless for me to actually get the remaining stickers for the missing slots. Luckily for me, after attending a friend’s wedding last December 11, my wish came true. The wedding ended really late that night and before we know it, it was almost midnight already. Before deciding to go home, my friends and I decided to drop by Starbucks first. I started to panic when we reached the place and realized that I didn’t bring my coupon with me. Little did I know that I could actually get another coupon for my new stickers. Good thing, one of my friends told me about it. As we were all discussing what we would be ordering, one of my friends brought up the SB planner as a topic. I then found out that most of them either have it or are merely not interested in getting one. I smiled and took advantage of the situation of giving them a hint that I really wanted one. Actually, they knew about it since I have been posting status messages on Facebook about it all week already. They decided to give me all the stickers from their purchases that night. I was ecstatic and I was really thankful that they helped me complete all the stickers that night. The following week, I was able to get my dream planner. There were three colors available: Dark Brown, Velvet Maroon and Silver. I ended up choosing Velvet Maroon because it had texture and it certainly looked classier in my eyes. 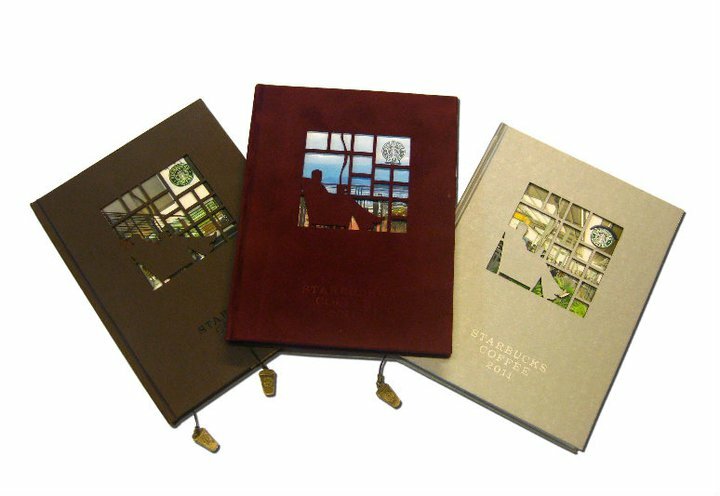 This year when I went to one of their branches, I realized that there were still a lot of people who didn’t get their 2011 Starbucks planners just yet. I was blessed to be one of those lucky people to finally have one. Until this day, I am still thankful to those who helped me get one. Until next year, Starbucks, I will be back to collect my next batch of stickers and will again hope to get your much coveted planners. To those who never got their 2011 planners, better luck next year. Hopefully, you will all be able to get one by then. Finally, here's a photo of me holding my chosen Starbucks planner. Isn't it just lovely?